1.0HP, 750W Pre-wired Lathe Speed Controller and Motor to suit a range of lathes including; Myford Super 7, Tri-Lever, Myford 254, Raglan Mk5 “Little John”, and Boxford AUD etc. Supplied with correct B56 pattern “direct-replacement” motor to bolt straight on to the Myford and Raglan motor bedplates. Completely pre-wired (no wiring required at all!). Can also be supplied with Metric D80 frame motors to suit using on other machines. Fitted in approx 30mins. Full installation & Operating Instructions supplied. Features; Emergency Stop, Start & Stop, FWD/REV, Inch and Variable Speed. EMC / CE Compliant. Designed and manufactured here in the UK. SKU: CL750. 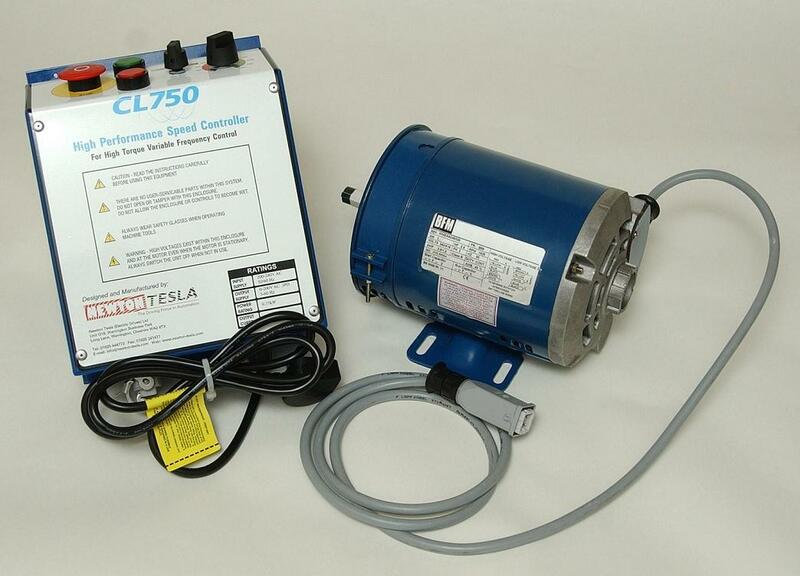 Category: Pre wired Lathe Speed Control Packages for Myford ML7 & Super 7 lathes. Tags: Boxford, CL750, Colchester, Controller, Lathe, ML7, Myford, Raglan, Speed, Super7, WARCO. Many thanks, package arrived safe and sound, fitted perfectly. Very pleased. Extra long motor lead just right length. As I reported already the CL 750 is installed on my lathe. It does all what it promised! And installing was quite simple, was literally plug and play!" This company is such a pleasure to deal with; straight-forward and quick delivery time. I should have fitted the CL750 to my Myford years ago. I have been putting up with the ‘orrible single-phase motor/switch arrangement for years. Straightforward fitting and a revelation now! Soft start is great and I love the speed control. What a great product. In due course another will be fitted to my Tom Senior mill. I was considering changing my aging super 7 for one of the far eastern imports but when I was looking back through my Model Engineers workshop there was a review of this unit and I decided to upgrade what is a good solid machine. I ordered the unit which I received in only a few days and installed the unit in a very short time, (removing the motor pulley being the hardest job). The unit has transformed the lathe and given functions only obtainable before with belt or gearing changes. The package with the CL750 arrived here yesterday afternoon. This morning I made the preliminary test as per downloaded manual and this afternoon I have installed everything. There where some complications but only mechanical in nature. But, then again: I didn’t expect it to be a drop-in replacement and all the issues are solved. Now everything works fine. I haven’t had the opportunity to actually use the lathe but it runs much, much more quiet at all speeds. A quick note to thank you for the new lathe control system for my Myford Super 7. It arrived by TNT about midday yesterday (Wednesday) and it was fitted and running by late afternoon and I managed to finish the job that had been stuck in the lathe since the original motor had blown. The new motor is lovely and smooth by any standard but particularly when compared to the old motor! It was quite funny when I first hit the ‘start’ button, the lathe clutch was disengaged and I thought something was wrong as nothing seem to happen but then I realised the motor was running but so quietly I had not heard it wind up. Anyway the new system seems to be really lovely and worth the wait. Just a quick line to say that the CL750, 1.0hp Package for Myford Super 7 has fitted fine to my Taiwanese-built LEAD SUN MJ-650 metal working lathe.